As 2016 draws to a close and many of us look forward to spending time with family and loved ones, one cannot escape the joyful jingles that herald this season. Whether you celebrate Christmas, Hanukkah, or Kwanzaa, the holidays that mark the end of the calendar year give us pause to reflect on the blessings associated with giving and receiving. Within the context of medicine, as physicians, we “do for others” by offering our skills and services to care for patients. We give of ourselves—often sacrificing time away from family, friends and other pursuits—in the hopes of bringing healing to others. These acts of giving—encoded in the Hippocratic Oath and over the course of years of training through medical school and residency—are emphasized as an instrumental part of the physician’s professional creed. Distinct and separate from this form of giving, however, is another kind of giving: volunteering. 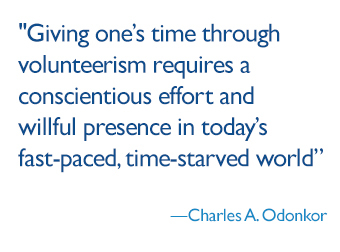 Giving one’s time through volunteerism requires a conscientious effort and willful presence in today’s fast-paced, time-starved world. Less fortunate individuals often depend on the selfless acts of volunteers who give countless hours throughout the year toward greater goals, such as community building and development. Through a cadre of service groups, volunteers give to others by bringing hope to those filled with despair and by helping to improve the lives of individuals within disadvantaged communities. Since moving to Baltimore from New Haven, where I completed medical school, I’ve sought opportunities to become engaged within the Baltimore community at large. My experiences training in both cities have given me a nuanced perspective of the baffling tensions between “town and gown,” so to speak. As a result of their lived experiences and interactions with the institutions, most people living within these communities believe that the academic achievements of esteemed institutions, such as Johns Hopkins and Yale University, have historically been inconsistent with the pace of development of the surrounding, less affluent communities where these erudite towers of learning are situated. Strained relationships between academic institutions and local communities are nothing new, however. They date back as far as the infamous Battle of St. Scholastica in 1335, during which a bar fight led to a group of townspeople killing multiple scholars at the University of Oxford. Fast-forward several centuries later, and institutions like Johns Hopkins have since recognized the need to invest in the surrounding communities as a whole. Johns Hopkins specifically has developed a community engagement inventory, which catalogs multiple community partnerships and programs, and champions volunteerism within Baltimore and its surrounding neighborhoods. At the end of each year, Johns Hopkins recognizes from among its more than 55,000 employees, individuals who best uphold the spirit of volunteerism and giving back to the community. 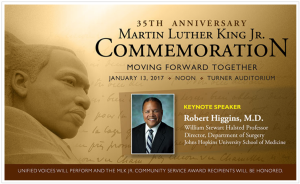 It was humbling to be chosen this year as one of eight honorees from across the university and health system who will be recognized at the 35th Martin Luther King Jr. Commemoration on January 13, 2017 for outstanding commitments to volunteer community service. Upon meeting the other awardees, I found it inspiring to hear about their contributions to Baltimore and the ways in which Hopkins employees are working to improve the quality of life in their communities. I was selected to receive the award based on a need I identified while serving on medical school admissions committees and from speaking with many high school and college students applying to college and medical from underrepresented communities. Several students confessed to struggling with putting together a strong application, and, in particular, drafting compelling, error-free essays, which are a critical component of the application process. Together with a few colleagues, I started a free essay writing and review service, which has helped more than 400 students since 2011. It has been an intrinsically rewarding experience helping these students over the years. Being recognized for this work is a humbling reminder of my responsibility to continue striving to help others; that making a difference matters; and that every day is a time for giving. May this season of giving compel each of us to continue making a difference in our communities and to give to others in the coming years. Learn more about how to volunteer in your community.